“A lot of people in the food community don’t want to look it straight in the eye. But I have a lot of people in my life that aren’t in the food community, where the only thing they’re eating is fast food. And they love it,” says Choi. 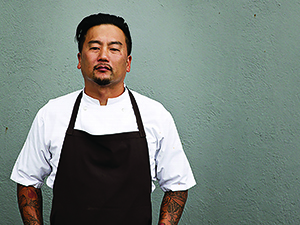 Aiming to deliver healthful, high-quality food using the same infrastructure, marketing and energy QSRs have mastered, Choi is partnering with like-minded San Francisco chef Daniel Patterson to launch Loco’l in spring 2015. “We want to create that feeling of fast food, but through natural ingredients,” says Choi, vowing price points of $2, $4, $6 and $8. He’s tapping into a trend that shows no signs of slowing. “Healthier is on the upswing of a very strong growth curve,” says Darren Tristano, executive vice president of Chicago research firm Technomic. “I would expect not only brands to emerge as healthy concepts but also brands that are focusing toward being better for you and feeling good about what you’re eating,” he says. At least 15 concepts in Restaurant Business’ latest Future 50 ranking of the fastest-growing emerging chains, many of them fast casuals, tout health. Big players are in the game, too. True Food Kitchen, with nine locations operated by Phoenix-based Fox Restaurant Concepts in partnership with Dr. Andrew Weil, is expanding nationwide with backing from P.F. Chang’s, a majority owner. And in August, a Memphis-based Wendy’s franchisee bought a minority stake and took over as CEO of LYFE Kitchen, the 11-unit better-for-you chain started by former McDonald’s executives. The choice of words is notable. While fast casual has been besting all other categories with 11 percent growth over the last five years, these chefs are not angling to be the next Chipotle, but McDonald’s. And Choi hopes the competition will move the giants to deliver better food to the masses.